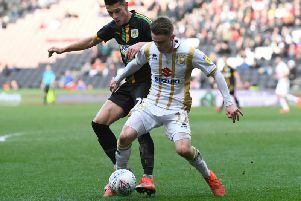 He was being ribbed for not scoring all season, so it was a weight off Alex Gilbey's shoulders to bag a brace against Morecambe and send MK Dons back to the top of League 2. It was 310 days between Gilbey's goals, but his opener just before the hour mark at Stadium MK on Tuesday night did a lot to settle the nerves. Kieran Agard had been substituted just before Chuks Aneke pulled up injured - frustrating timing according to manager Paul Tisdale - and with the crowd on edge, Gilbey's strike from the edge of the box was more than welcomed. His second sealed the deal in almost a carbon copy. "We had been ribbing him a bit for not finding the net yet, so it was a timely brace, and he's delighted," said Tisdale afterwards. "When he starts adding goals to his game, he will be a big, big asset to us. I'm delighted with his performance." "I think I needed to add goals," Gilbey added. "I needed them badly after a slow start but now I'm feeling really good. "It was really frustrating, but luckily we've got some top strikers at the club who can bail everyone else out! The goals are a bonus but the most important thing is the clean sheet and the points. "I enjoyed the first one the most because Rhys Healey was telling me to pass it – I don't think he had much confidence in me! It was nice to see them go in."